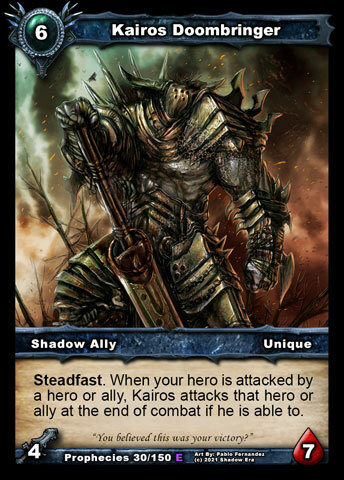 Kairos is probably one of the coolest cards in the new set, and thus one of my favorites. His ability does something really unique, and add an entire new layer of strategy to the game. Basically, he's everything you'd think of when I say 'Epic Ally'. Ability: Steadfast. When your hero is attacked and the attacker survives, Kairos attacks that hero or ally if he is able to. 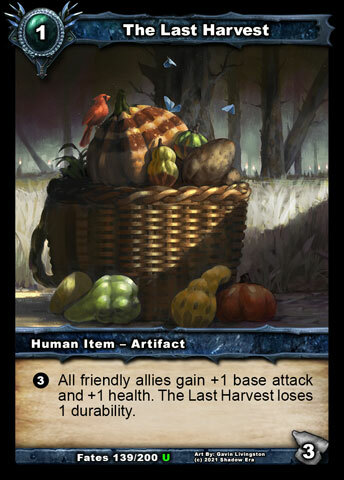 Flavor: "You believed this was your victory?" Despite being an army formed of forces from across every world now connected to Balor, no one among the Shadows knows what inspired their leader to gather them together. They do, however, know the name 'Kairos Doombringer ' and that he had been involved since the very beginning. He serves as the personal bodyguard and right-hand to the Man of Shadows. When a task needs done, and it needs to be done as violently as possible, Kairos is sent into the front lines. Almost everything else about Kairos is shrouded in mystery. Which world the creature hails from is unknown; as is his true name. In reality, most aren't even sure it can speak. Even the name 'Kairos' is a fabrication. It comes from ancient Balor texts and translates to 'Vessel of devastation'; likely awarded to him after visiting unspeakable suffering upon many of the smaller villages in the outskirts of Layar during the earliest days of the war. Despite this propensity for terror, Kairos has proven himself a trustworthy asset time after time, fully in control of these destructive tendencies. 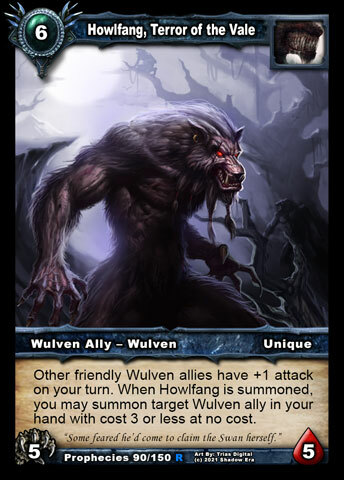 While Howlfang was leading the attack on the Vale, the silent 'guardian' was sent on a task of his own. Leaving behind a bloody swathe of bodies, he hunted down the final words of an aged priest scribbled down in a journal that had been left to an adopted son for his master. By leaving no witnesses behind, Kairos made sure it was hours before anyone even noticed the book was gone. Eventually, the young mage who'd inherited the book managed to follow him back to the forgotten jungles known as 'The Wilds', but the Man of Shadows had already gleaned what he needed from it and cared little for the boy's escape. If Kairos was capable of any emotions at all, they were well suppressed as he watched the boy flee the abandoned continent with his life intact. Cold and silent, the creature with no history knew it only needed to bide its time. Brutality always found a way. My guess is that he's Loest. Probably my only reasoning for Jericho is that the book was from a priest and we know that Jericho always carries a book. Also, we don't have a backstory on Jericho. On the other hand, Loest has his father's journal but I'm not sure if Loest was that young when his father passed away. It seemed like Loest reached around 16-20 years of age before his father passed. And Jericho has no backstory unless I missed it somewhere. Nachyo please have CiPs of Heroes I would really like to know why or how they came to be. There is a LORE section linked from the very top, which has these as articles instead of threads, but I take your point that we could showcase this a lot better. It's Loest, Joeyboi. He took the journal but Kairos had already torn the important parts off, so he didn't care too much when he got away. Later Loest reads the journal and notices the torn part.